http://www.JewishWorldReview.com | Of all the reasons to oppose the death penalty for Dzhokhar Tsarnaev if he is found guilty of the Boston Marathon terror bombings, none is less convincing than the claim that executing the murderer of Krystle Campbell, Lingzi Lu, Martin Richard, and Sean Collier would amount to rewarding him. Seek Tsarnaev's death and you give him just what he craves, runs this argument, which has been made by law professor Alan Dershowitz, criminologist James Alan Fox, and death-penalty critics in the media. Executing Tsarnaev will succeed only in making him a martyr and a hero, they say; it will drive more attention to his cause. "His face would appear on recruiting posters for suicide bombers," Dershowitz warned last year in an essay for The Guardian. "The countdown toward his execution might well incite other acts of terrorism." 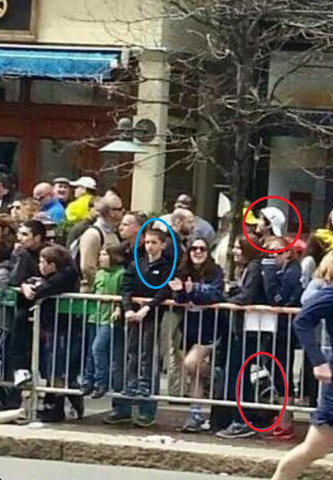 This photo from the 2013 Boston Marathon shows accused bomber Dzhokhar Tsarnaev, wearing a white cap, standing just inches away from 8-year-old Martin Richard behind the barricade near the Copley Square finish line. What appears to be Tsarnaev's backpack with its pressure-cooker bomb is on the sidewalk. Closely related is the objection that executing Tsarnaev hands a propaganda victory to nihilists who think the key to paradise is to maim and murder in the glare of publicity. If federal prosecutors actively pursue a sentence of death, they'll be keeping that publicity alive, generating waves of fresh media coverage for the jihadist's evil motivations, and boosting his stature among his supporters. But a conviction followed by decades in prison, say death-penalty opponents, would replace that spotlight with insignificance. Within a few years, he would vanish from public consciousness. Deny him the hype and notoriety of death row, and Tsarnaev will molder in obscurity, a role model for no one. But there are obvious weaknesses with this argument. Life imprisonment offers no assurance that interest in a depraved killer will dry up, as the grotesque and ongoing pop culture surrounding Charles Manson has repeatedly shown. Nor does executing a mass murderer necessarily hand a propaganda victory to his abhorrent ideology or admirers. Oklahoma City terrorist Timothy McVeigh was determined to cast himself as a martyr in a lofty cause, and many people, including McVeigh's defense team, warned that putting him to death might lead to further attacks by inflamed supporters. It never happened. Yet there's a much more grievous flaw with opposing capital punishment for someone like Tsarnaev on the grounds that it will cloak him in martyrdom. It implies that society should care less about what justice requires than about not giving other murderers a pretext to seize on. It perpetuates the ugly canard that when judge and jury uphold the rule of law, fairly and rationally punishing the most atrocious of all crimes with the most severe penalty our legal system allows, they are guilty of perpetuating a "cycle of violence." Putting Dzokhar Tsarnaev to death - assuming the jury, after due process of law, unanimously finds him guilty and determines that he should die - would be an affirmation of our commitment to justice. It would acknowledge the moral awfulness of the choice Tsarnaev made when he set that backpack with its pressure-cooker bomb behind a little boy in the crowd on Boylston Street. It would mete out the only penalty proportionate to the terrible crimes he committed that day, crimes that left four innocents dead, and hundreds wounded: the deprivation of his own life. Yes, it is always possible that other haters or terrorists might exploit Tsarnaev's execution, pointing to it to rationalize atrocities they choose to commit. But to treat that as an argument against carrying out the death penalty is like treating last April's bombings as an argument against holding another Boston Marathon. Those who commit monstrous acts of extreme evil can always find justifications for what they wish to do. A society that refrains from pursuing justice against its worst criminals lest other criminals turn it into a talking point doesn't thereby become safer. It becomes more vulnerable. In federal court in Boston today, Tsarnaev's lawyers will argue that they can't possibly be ready for trial until September 2015 at the earliest. And so it begins - the endless motions, appeals, and delays to keep justice from being done. Death penalty opponents often claim that execution is "too good" for capital murderers, and that life imprisonment would be a far more awful fate. Yet roughly 99 percent of capital defendants and death-row inmates use any legal stratagem to stay alive, and Tsarnaev is unlikely to prove an exception. Putting him to death would be no reward. Watch as he and his lawyers go to every imaginable length to make that clear.